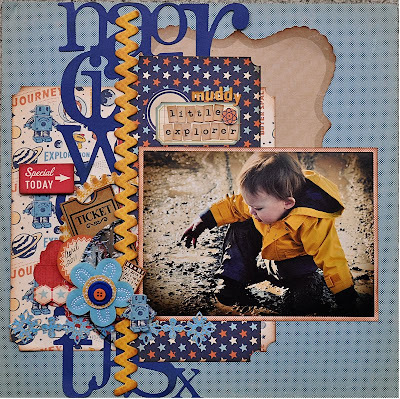 Creative Authority: Creative Scrappers Sketch #160 - Boy version! Creative Scrappers Sketch #160 - Boy version! 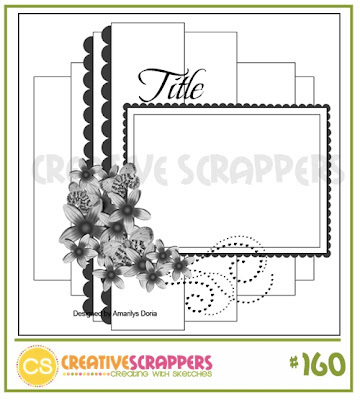 Have you been to Creative Scrappers lately? The sketches are amazing over there...make sure you go to their blog and check it out. All the past sketches are on the right hand side, allowing you to use whatever you want for whatever lo you are doing! I used the October Afternoons' Rocket Age line. It is super cute and totally made for those little wonderful boys in our lives! I used some pieces from the rest of my stash that matches and plays up on the colors. This is of Shea playing in the mud this April...he loves being outside and exploring the outdoors! Thanks for looking all...see you soon! P.S. - I will be posting some pictures of my almost put together quilt...stay tuned! I so love all paper, ribbon, buttons and embelishments of all kind...it is just so hard deciding what to use on each project! I am a scrapbooker, card maker, baker, cook, sewer, knitter, crocheter (just starting), daughter, mother, sister, wife and friend. I have a wonderful family that is filled with caring people, love and laughter. My home is in Manitoba Canada with my husband, my beautifull little guy and two four legged friends.